Find out how to publish pages, files and folders within the campus CMS. Staging is the preview or staging site. Always leave this checked. Delivery is the live site. Uncheck "delivery" if you are still reviewing a page or want to share a preview link with a manager or colleague. Leave "delivery" checked if you want to publish to the live site. You can publish a single page, a folder, or the entire site though we recommend publishing the smallest number of files at a time because there is only one publish queue per site. Do not publish the entire Blink or TritonLink site. It will take hours, and those sites are published every weekend already. You don't need to publish blocks or homepage_internal assets. Instead, you publish the page they appear on. When you publish a folder, all pages within that folder will also be published unless you set them to not publish. 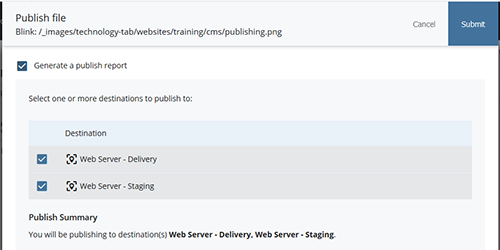 When you create a new page or folder in your site, you have to publish the parent folder in order for your new content to appear in the left-hand navigation. If your new page or folder is at the first (top) or second level, you will need to republish the entire site for the new content to show up in the top navigation that is displayed on every page. When you submit a publishing job, a pop-up will show: "Page queued for publish. View publish queue." You can click on View publish queue to see the progress of the publishing job. To check the publishing queue from any page, click on the hamburger menu (three horizontal lines) in the upper right corner and click Publish Queue. If you published to delivery, bring up the page in your browser and hit the refresh button. Note: You need to be on the UCSD network (or using VPN) to view staging sites. If you published an existing page to stage only: Bring up the live page add "stage-" to the beginning of the URL. it means that this file (or a folder that contains this file) has publishing disabled. You will need to check if the page and/or any folders containing it is enabled for publishing. A common scenario is trying to publish a news item for your home page. In that case, publish the actual page (/index) not the news block. The page will be published during routine maintenance (for example, all of Blink and TritonLink are published over the weekend).